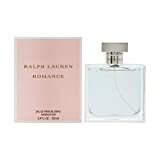 Romance By Ralph Lauren For Women. Eau De Parfum Spray 3.4 Oz. Romance is a scent of romantic love and intimate moments full of joy and happiness, with an endlessly positive aura. At the beginning of the composition the notes of rose blend with citrusy oils and receive an unusual, unique melody. The pellucid flower of water lily, lily and romantic white violet give this perfume its silent grace and the spicy notes of carnation and ginger refresh. Patchouli, oak moss and white musk finish the composition gently. The perfume was created by Harry Fremont in 1998. This product is manufactured in USA.